I’m going to preface this series on internal conflicts by saying that no two situations are exactly alike. Sure, there are some common themes to most conflicts within a band: ego, money, transportation, girls or guys, scheduling or time issues, flakiness or lack of commitment, and even death. I’m going to be talking about what I think are the three overarching themes: money, time, and personality. But I just want you to know that there isn’t necessarily a definitive way to handle conflicts. You must be willing to dig deep into your situation to find the root cause of the issue. Let’s begin by talking about money. Conflict with money often comes up because someone in the band isn’t willing up to pony up their fair share. Maybe you just recorded an album or had some new T-shirts done up. Your band mates might have agreed to cover an equal portion of the expense, but when it came time to make good on their promise, they balked. It’s not unlike when you come out with a new release – people might have told you that they would buy it, but when you finally held a CD up in front of their face, they backpedaled. Money is where the rubber meets the road. It’s where one’s true commitment is tested. 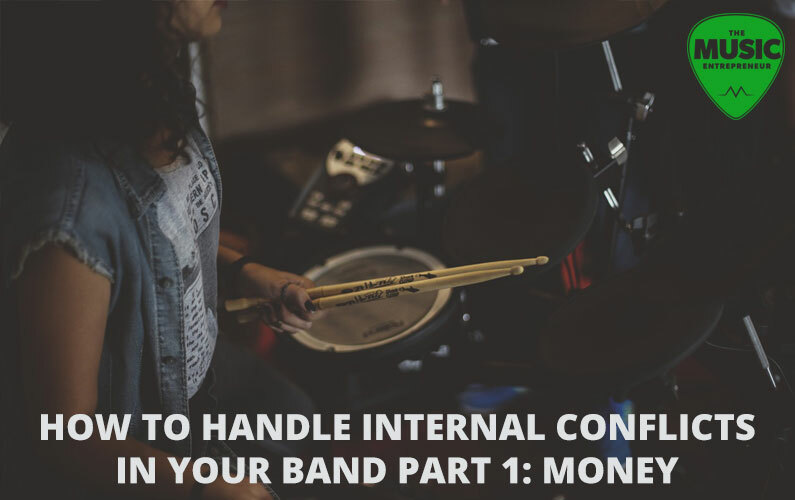 Arguments about money often come up because you haven’t put adequate boundaries in place for how you’re going to handle finances within your band. Create a separate band fund. Instead of relying on individual members to have the money when you really need it, why not create a separate bank account strictly for managing band funds? What the band earns goes into this account so that when you really need the money, it’s there. You’ll be less inclined to spend what you don’t have. If your band members insist on getting paid for every show, then agree to save a certain percentage of the total amount. Discuss your priorities. What is most important to the band? Recording a new release? Hiring a publicist? Developing a website? Creating merch items? Figure out what’s most important to your band. Where do you want to spend your money, and where do you think you will you see the greatest return? Make a plan and stick to it. Let’s say, for example, that you’re earning $500 per month as a band. You know that you want to record an album in eight months, and it’s going to cost you $5,000. Unless you have extra money saved up, you’re either going to have to adjust your timeline, or you’re going to have to figure out a way to earn an extra $1,000. Your band mates will have a better idea of what to expect when the numbers are concrete and aren’t just pulled out of a hat. Keep them updated. Get your personal finances in order. Ask your band members to do the same. When you don’t have any financial pressure in your life, you’ll be better able to focus on the creative side of making and marketing music. You won’t put any undue pressure on your music career to produce for you either. Even with the best laid plans and intentions, disputes about money can still come up. There’s a reason why money is one of the leading causes for divorce. Be conservative. Never spend more money than you have, and don’t go into debt, even for seemingly “good” reasons. Don’t make plans based on projected income. Always be realistic.